Close to 300 people escaped the cold and enjoyed the opening night of Onsite Gallery’s latest exhibition, How to Breathe Forever. The group exhibition underlines the importance and interconnectedness of air, animals, land, plants and water. 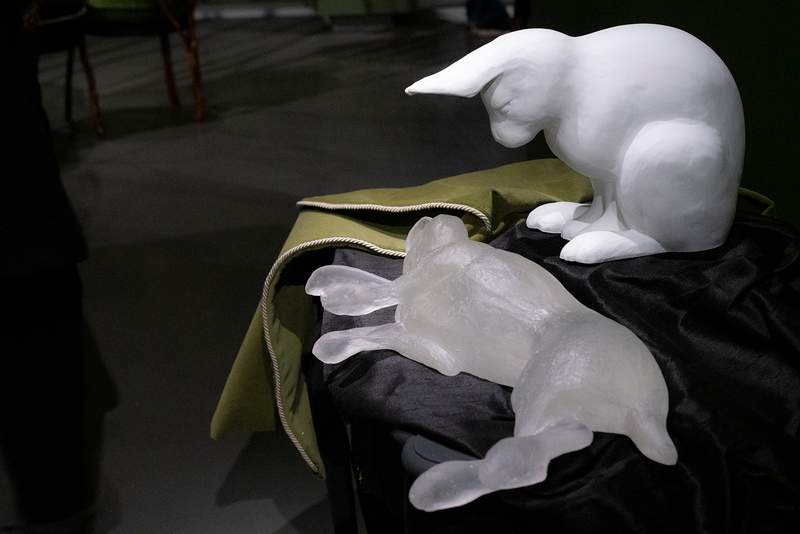 Featuring work by local, national and international artists, How to Breathe Forever invites visitors to consider an expanded personhood that attentively collaborates and exchanges with living things. Curated by Lisa Deanne Smith, Onsite Gallery’s Curator, features the work of international artists including OCAD U alumni Rouzbeh Akhbari, Mary Anne Barkhouse and Maryanne Casasanta, alongside DaveandJenn, Li Xinmo, Qavavau Manumi, Felix Kalmenson, Naufus Ramírez-Figueroa, Ningiukulu Teevee and Flora Weistche. The public opening reception featured remarks by Archer Pechawis. A performance artist, new media artist, filmmaker, writer, curator and educator and member of Mistawasis First Nation, Saskatchewan, Pechawis thanked Onsite Gallery, OCAD U and the exhibiting artists for their creativity and vision. President Sara Diamond congratulated Lisa Deanne Smith, who personally thanked the exhibitors in attendance: Mary Anne Barkhouse, Maryanne Casasanta, DaveandJenn, Rouzbeh Akhbari and Flora Weistche. 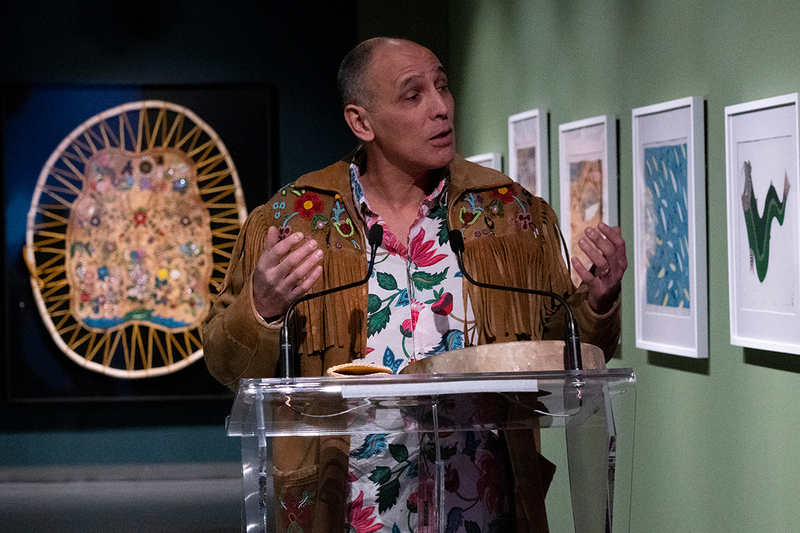 The exhibition is presented with the support of the Canada Council for the Arts, the Ontario Arts Council and Nexus Investments, the free exhibition runs through to April 14, 2019. Sara Diamond and a team of researchers from OCAD University and the University of Toronto have collaborated on a blueprint to make Toronto a world leader in public art projects. Incorporating interviews with artists, real estate developers, architects and other key stakeholders, Redefining Public Art in Toronto examines local and international public art policies. The researchers examined the city’s history of public art projects dating from 1967 to 2015. The report was presented at a launch event on Oct. 23 at OCAD U's Onsite Gallery. The report makes a number of recommendations including updating the public art policy drafted in the 1980s, improving funding mechanisms and opening up the definition of “public art” to include digital and performance art, while integrating public art into all future planning. The report is available for download online. On Friday, September 15, OCAD University welcomed Mélanie Joly, Minister of Canadian Heritage and Member of Parliament for Ahuntsic-Cartierville. This is Minister Joly’s first official tour of OCAD U since taking elected office in 2015, although she visited in April 2016 to host a creative sector roundtable here. Minister Joly met with OCAD University President Dr. Sara Diamond and other university leaders to discuss priorities and policies. The Minister took part in a personal tour of the campus, including a visit to Imagination Catalyst, OCAD U’s entrepreneurship and commercialization hub. Member of Parliament Adam Vaughan joined Minister Joly for a preview the new Onsite Gallery, funded partly by the Canada Cultural Spaces Fund. The Department of Canadian Heritage oversees an umbrella of organizations dedicated to the cultural, civic and economic vitality of Canada. Mélanie Joly was appointed Minister of Canadian Heritage by Prime Minister Justin Trudeau after the 2015 Federal Election. President's Speaker Series: Mel Chin "You are Never Done"
"You are Never Done" Presented by the President's Speaker Series in association with Onsite Gallery’s ONSITE/EXCITE/INSPIRE program, Chin's lecture, "You are Never Done" will focus on the eternal and essential vigilance justice requires of its advocates and the parallel condition within the practice art - the worthy project we can never consider finished. An ever-shifting political landscape serves as a backdrop and source of inspiration for art with social impact, work that must remain responsive to change and continually extending and reinventing itself to effectively inhabit the society it aims to help shape. Mel Chin breathes life into the once static work of art with his complex and poetic collaborative projects that learn, adapt and evolve to the ever-changing communities they inhabit. Mel Chin, born in Houston, Texas, has become internationally synonymous with "art as social change", creating over the past thirty years an exceptional body of often political and activist work that provokes greater social awareness and responsibility. Through his broad and multidisciplinary range of approaches, Chin's art insinuates itself into unlikely places, including destroyed homes, toxic landfills and even popular television. Chin's work, described as both analytic and poetic, often employs community and collaborative teamwork, conjoining cross-cultural aesthetics with complex ideas. Documented in the popular PBS Program, Art of the 21st Century, Chin has received numerous awards and grants from organizations such as the National Endowment for the Arts, New York State Council for the Arts, Art Matters, Creative Capital, and the Penny McCall, Pollock/Krasner, Joan Mitchell, Rockefeller and Louis Comfort Tiffany Foundations, among others. Onsite Gallery’s 2016 ONSITE/ program investigates stimulating change through public platforms outside the gallery. Read more about President's Speaker Series: Mel Chin "You are Never Done"
The OCAD Professional Gallery at the Ontario College of Art & Design (OCAD) is pleased to present From 15 Minutes into the Future, an exhibition of work by internationally renowned designer Karim Rashid, from November 9, 2007 to January 20, 2008. The exhibition launches Friday, November 9, with an opening reception from 4 to 6 pm, followed by a free public lecture at 7 pm. Karim Rashid is one of the most significant cultural shapers in the world today. He is a leading figure in the fields of product, interior design, fashion, furniture, lighting and art, known for his uncanny ability to visually describe our contemporary culture with his democratic design sensibility. The OCAD Professional Gallery will showcase a selection of Rashid’s more than 2000 designed objects that have been put into production, as well as custom-designed ceiling and wall treatments created especially for the gallery and the exhibition. Born in Cairo, half Egyptian, half English, and raised in Canada, Karim now practices in New York. Designing for an impressive array of clients from Alessi to Georg Jensen, Umbra to Prada, Miyake to Method, Rashid is radically changing the aesthetics of product design and the very nature of consumer culture. In addition to his many designed and produced products, Rashid has successfully entered the realm of architecture and interiors as evidenced by the design of the Morimoto restaurant in Philadelphia and Semiramis hotel in Athens, which won a Sleep05 European Hotel Design Award. OCAD recognized Rashid’s extraordinary career with an Honorary Doctorate in 2006. Other awards include the 2005 Honorary Doctorate from Corcoran College, 2005 Pratt Legends Award, 2004 A.D. Dunton Alumni Award of Distinction from Carlton University’s Alumni Association, 2002 ID Magazine Annual Design Review Best of Category, and 2003 best Retail Store in the USA. His work is in the permanent collections of major museums around the world, including New York’s Museum of Modern Art and the San Francisco Museum of Modern Art. Rashid has taught at the University of the Arts in Philadelphia, the Pratt Institute, Rhode Island School of Design, and OCAD, and is a frequent guest lecturer at universities and conferences globally. He has published several books; his most recent entitled Design Your Self is published by Regan Books. Karim Rashid’s lecture is presented as part of the Faculty of Design’s lecture series, generously supported by M.C. McCain. As part of Onsite Gallery's Flash Forward 10: Uncanny Worlds exhibition. Portfolio Reviews with Patrick Macaulay, Director, Visual Arts, Harbourfront Centre; Nicholas Pye, artist; and Meera Margaret Singh, artist. A Sharing Table facilitated by April Hickox, Jennifer Long, and more! Open to emerging and mid-career photographers with a cohesive body of work. Space is limited. Please email onsite@ocadu.ca for details. The deadline for submissions is Wednesday, October 29th at 5 p.m.
Onsite Gallery: 230 Richmond St. W.
Flash Forward 10: Uncanny Worlds special event. Portfolio Reviews with Patrick Macaulay, Director, Visual Arts, Harbourfront Centre; Nicholas Pye, artist; and Meeramargaret Singh artist. With a Sharing Table facilitated by, April Hickox and Jennifer Long.